Vienna 1905: After a carnival party the famous painter Heidenick draws his otherwise engaged girlfriend Anita Helfer with very few clothes on, only blurs her face. The image makes it into the newspaper the next day - but since he can't tell the model's name without offending her influential fiancée, he comes up with the fictional name Leopoldine Dur. Unfortunately there is a secretary with that name, who now gets into the focus of high society - and into Heidenick's, much to Anita's anger. This is a masterpiece. A gem in every way. Very reminiscent to Ernst Lubitsch, in style and substance. But it's no rip-off. If this were a Lubitsch film, it would be his best mmovie, and I'm a big Lubitsch fan. Director Willi Forst was very creative. I look forward to re-watching this often. Great buy, great find, great print, great film. Buy it, you won't be disappointed. This was a blind buy. 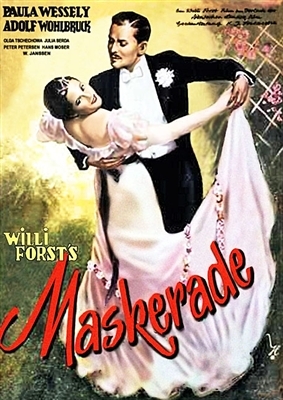 I was curious to see Anton Walbrook â€“ a favorite â€“ in his pre-British career. Here he plays a turn-of-the-century Austrian bon vivant with utter wit and charm. The other actors â€“ all new to me â€“ inhabit their roles beautifully. It mostly plays out in public social occasions: balls, music hall cafes, opera houses. The movie isn't total fluff â€“ it's chocolate bon-bon wrapped in some bitter sentiments. You may be reminded of some of the works of Max Ophuls. Indeed, there is a wonderfully exhilarating waltz sequence that advances through several rooms â€“ beautifully edited so that it appears to be in one sweeping camera movement. Perfection! Highly recommended.